Forum on improving udder health and milk quality to be held July 28-29, 2015 in Syracuse, N.Y.
Verona, Wis. [April 30, 2015] – The National Mastitis Council (NMC) will host its upcoming regional meeting July 28-29, at the Holiday Inn Syracuse/Liverpool in Syracuse, N.Y.
On-farm and classroom short courses will be held July 28, followed by the main program on July 29. Farm tours will be held the day after the meeting. Individuals from all segments of the dairy industry are encouraged to attend the meeting, which features networking and information sharing on udder health, milking management, milk quality and milk safety. Milk quality specialists, veterinarians, dairy producers, milk plant field staff, dairy equipment and supply manufacturers, university researchers, extension specialists, students and others interested in the production of quality milk are encouraged to attend. Watch for program updates and registration information online at www.nmconline.org, or contact the NMC office at nmc@nmconline.org or 608-848-4615 for additional details. 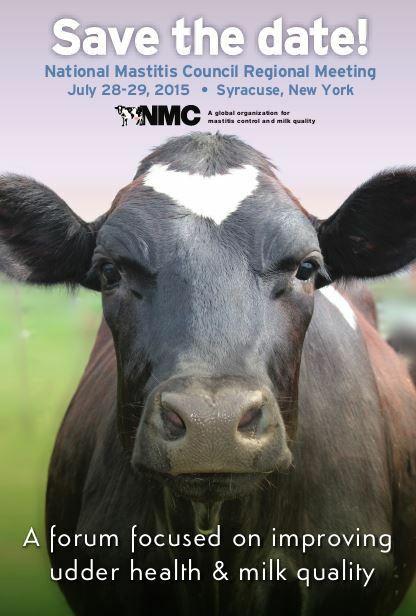 NMC is a not-for-profit professional organization devoted to reducing mastitis and enhancing milk quality. NMC promotes research and provides information to the dairy industry on udder health, milking management, milk quality and milk safety. Founded in 1961, NMC now has close to 1,500 members in more than 40 countries throughout the world.